To find gas, you have to have some idea where to start looking for it. This means you have to have some idea how it formed in the first place. 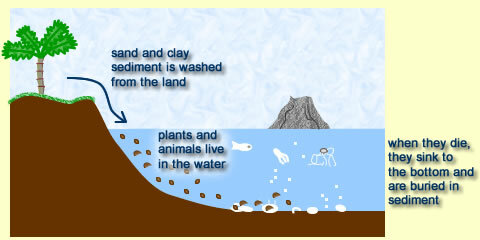 Plants and animals living in the water die and sink to the bottom where they mix with sediment washed from the land. The mixture is buried under more layers of sand. More layers build up, trapping and squashing the decaying remains of the plants and animals. This goes on for a very long time. 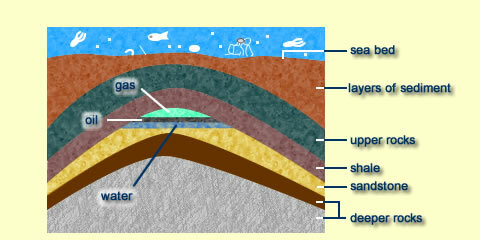 Over many millions of years, the layers build up, burying the decayed remains deep under the surface. 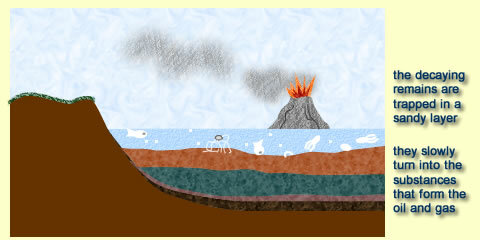 They are heated and squashed by the movement of the earth's crust and turn to oil and gas in the layers of rock built from the sediment. The movement of the earth's crust can result in rocks being bent. 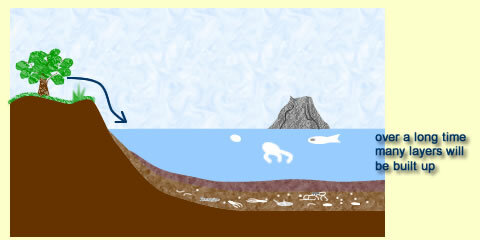 Oil and gas, from the decay of the plants and animals, is trapped if the layer on top of it will not let it rise upwards. Scientists look for these rock shapes because they might contain gas. < previous picture | But how can we find these rock shapes?